There have been some great goalkeepers in the Premier League over the years. Who can forget the legends of yesteryear? Players like Edwin van der Sar, David Seaman, Pepe Reina, Nigel Martyn and Neville Southall. Or modern day heroes, such as David De Gea, Petr Cech and Ederson. 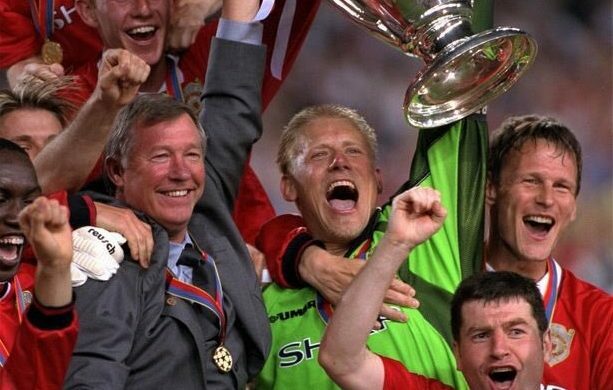 But according to a new BBC survey involving thousands of respondents, one man towers above the rest: the Great Dane himself, Peter Schmeichel (check out some of his best saves below). The former Manchester United great picked up 53 percent of the vote, well ahead of David De Gea’s 15 percent, Petr Cech (13) and Edwin van der Sar (10). David Seaman got 5 percent of the vote, Jens Lehmann 2 percent and Joe Hart and Ederson 1 percent each. Liverpool fans could perhaps be forgiven for consternation that Pepe Reina wasn’t among the nine keepers in the survey. But ultimately, even the most rabid of Reds fans would have a difficult time not submitting to the pedigree of the boisterous Dane – which boasts five Premier League titles, three FA Cups, one League Cup, one UEFA Champions League, one UEFA Super Cup and five Community Shields. He was voted the world’s best goalkeeper twice (and was runner-up twice), and he led Denmark to its fairy-tale Euro 92 championship. Following Manchester United’s win against Tottenham at the weekend, the club’s new coach, Ole Gunnar Solskjær, said De Gea was approaching the legendary status of Schmeichel … and Van de Sar. Not really, Ole. Not Peter the Great, at least. Not yet.